Should You Hire Third Party Trade Show Moving Services in MA? Planning a trade show, whether it is local in the South Coast area, or national to other states outside the northeast, can be a lot of work. From orchestrating the venue to inviting vendors and speakers, arranging for attendees to purchase tickets and even planning a few networking parties or two, the trade show industry has a lot of moving parts. Even if you aren’t running the entire show, attending trade shows to represent and market your company can also be a lot of work. From creating the expo booth to getting it delivered and set-up on time, there are a lot of tasks to keep track of for each event. 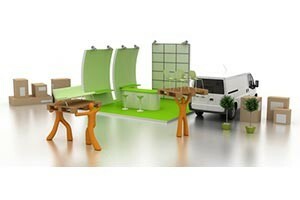 One way to make your work a lot easier is to contract with trade show moving services in MA. Even if your event is located outside of the New England area, a professional moving company that is experienced in packing supplies and services for the trade show industry can help. Conlon Moving & Storage is affiliated with United Van Lines, which means that we have access to logistical planning and moving for commercial clients all across the country and all around the world – wherever United Van Lines goes. You can count on this well-known and respected moving and mobile storage company in MA to help you achieve your goals. What is a Third Party Trade Show Moving Service? When you hire a professional moving company to take care of the logistics surrounding your trade show experience, whether it be as an event organizer or exposition participant, you gain years of knowledge and insight into how things should be packed, transported, unloaded and set-up at each event location. Even if you just attend one major industry trade show a year, it can be to your benefit to hire a professional moving and mobile storage company in MA. They will help you with all of the packing supplies and services, as well as work directly with the venue to ensure that everything gets delivered, unloaded and set-up the way that it should on-site. Different venues and locations have different rules. For example, due to union control over venues in places like Las Vegas, there are certain regulations regarding who can unload trucks brought in by a professional moving company – and who can’t. It is important that you know these things ahead of time so you won’t get caught off guard. This is just one of the many ways that a logistics company can help you with trade show moving services in MA and anywhere else you need to go. The types of services will vary, with some clients requiring packing supplies and services such as mobile storage between trade shows, but the basic overall service of providing logistics for a professional moving company should be the same. Because you are working with the moving and mobile storage company in MA for more than just a single move or situation, it is important to create a partnership. Working together on the task of providing you and your team with trade show moving services in MA and beyond can help to make everything come together more cohesively. Outlining what you want or need, as well as what you don’t want or need, can help the planners at the professional moving company to better understand what you are hoping to get out of the partnership. Will a third party logistics company be beneficial to you and your business? The answer to that question will depend on a number of unique factors that pertain only to your exact business, what you are hoping to get out of the relationship and whether or not the professional moving company that you hire is up to the task. If the trade show moving services in MA are able to help facilitate your participation in industry trade shows without hindering it in any way, then yes, the service is of value. However, if it becomes apparent that the services are slowing you down or proving to be a distraction in other ways, then perhaps you should look at other options. Call Conlon Moving & Storage to find out more about our professional moving company services for trade shows and other commercial needs. Contact us at 508-336-7766 and we can help you determine whether or not your business would benefit from the services that we provide.